What Can a Discussion About Fashion Tell Us About America’s Culture of Violence? A Lot. Like so many others, I’ve been thinking a lot about gun control in the wake of the mass shooting in Newtown, Connecticut. Although the discourse around gun control can be sometimes mystifying, if not downright mind-numbing (teach kids to rush at shooters rather than hide; enlist a male janitor to heave a bucket at the shooter’s knees?? ), I’ve appreciated the many thoughtful discussions that link unthinkable violence such as that which took place at Sandy Hook Elementary School to the many acts of violence that many Americans just don’t think about, like the U.S. drone strikes in Pakistan and Yemen that have killed scores of civilians (including children) and the street shooting deaths and injuries of predominantly black and brown young people in cities like Chicago, Oakland, and Jacksonville, Florida. But what does fashion and style have to do with America’s culture of violence? A better question might be, what can a discussion about fashion and style illuminate for us about this culture of violence? A lot, it seems. There’s another, also gendered, dimension of America’s culture of violence in which women and girls are predominantly the perpetrators and victims. 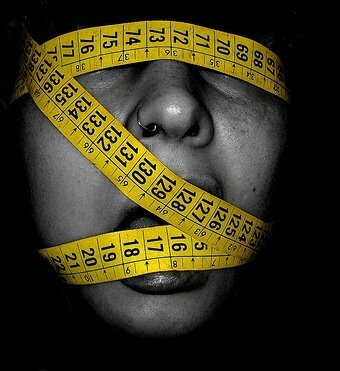 The “slow violence” of body dysmorphia and eating disorders are a significant, if often invisible, part of America’s culture of violence that implicates women across generational, racial, class, and sexuality differences in uneven ways. violence that occurs gradually and out of sight, a violence of delayed destruction that is dispersed across time and space, an attritional violence that is typically not viewed as violence at all. Although Nixon’s discussion of slow violence focuses on environmental catastrophes like industrial pollution and the aftermath of chemical warfare, his concept can be extended to the particular relation of gender and violence that women and girls experience every day. Because girls from a very young age are conditioned to believe their identity and self-worth is tied to their appearance, to please others, and to seek out the approval of others, they are especially vulnerable to the countless verbal and nonverbal messages they receive about their never perfect bodies from family, friends, co-workers, and a wide array of media including women’s magazines, men’s magazines, fashion blogs, pro-ana websites, diet and exercise books, TV shows, and websites. The failure to fulfill all the requisites of ideal femininity triggers for many women and girls the slow violence of low self-esteem, anxiety, and depression and for some others, drug and alcohol abuse, cutting, and disordered eating behavior. Formal studies like these don’t take into account the slow violence of “body-checking”—the everyday pinching, tugging, and monitoring of body fat—that so many women and girls casually perform on themselves and others everyday. For nonwhite women and girls, gender violence is often bound up with racial violence. Precious few studies include the impact of racial hierarchies and norms of beauty on women of color’s everyday body-checking. The whitewashing of eating disorders (anorexia as a white girl’s problem) also conceals the role race plays in the diffusion and development of negative body perceptions. Additionally, the slow violence of pro-ana ideologies that view rigorous dieting, exercising, and starvation not as problems but positive lifestyle choices are too infrequently discussed. The scope and scale of body shaming clearly indicate that the fashion industry is not solely to blame for this gendered sphere of America’s culture of violence. But the fashion industry isn’t entirely off the hook either. As a purveyor of millions of globally-circulating images and words that reinforce and celebrate a body ideal that 95 percent of U.S. women cannot attain naturally, it has enormous power to impact the culture of slow violence that leads to the physical, psychological, and spiritual deaths of so many women and girls. More often, though, it normalizes impossible thinness (underweight models like Coco Rocha—a 5’10” model weighing 108 pounds—are told to lose weight and already-thin models are regularly Photoshopped to appear even more slender. Although the Council of Fashion Designers of America has come out against unhealthy modeling practices and the culture of fat shame, its policies have been weak and unenforced. The CFDA Health Initiative is a set of guidelines rather than mandates. Bans against using models under the age of sixteen have been repeatedly broken without any real consequences. As a result, adult women are tacitly told to strive for a pre-puberty body, a goal that engenders a myriad of interlinked slow violences. The fashion industry’s normalization of compulsory thinness is a huge reason why we only have estimates of eating disorders and disordered eating behavior. Shame and guilt about not meeting the standards of beauty and thinness as well as the shame from trying to attain these standards when we “should know better” has made invisible this culture of femininity and violence. It’s not my intention to detract from the national conversation about the epidemic of school and street shootings. Instead, my hope is to expand these discussions to include other relations of gender and violence that are no less a part of America’s culture of violence.